What is the future of Canada? In my opinion, the Canadian future is our kids. Too bad the prognosis for the children of baby boomers keeps getting gloomier as real estate prices keep edging up. Home prices in Toronto rose 7.4% this past October compared to a year earlier and thus pushed the unaffordability of Toronto's real estate even further. As incomes stagnate, young adults in Canada are forced to go deeper into debt in order to become a homeowner. Furthermore, many young adults who manage to get into the market are priced out of owning a detached place and end up settling for a shoebox in the sky. The reality is that rising home prices is nothing else but a transfer of wealth from the younger generation to an older one. Back to the October housing market stats in Toronto. 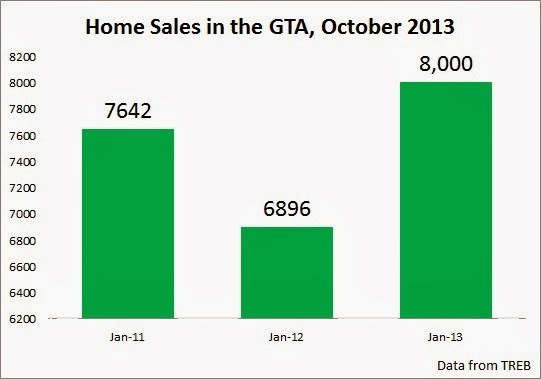 Toronto home sales were up by over 16% compared to a year earlier. Sales were up 4.7% compared to 2011. Active listings were down by 10.5%. Average days on the market declined from 28 in Oct 2012 to 27 in Oct 2013. Detached houses in the City of Toronto went up in price by over 12% in October 2013 as compared to a year earlier. In other words, detached homes in the city now cost $94,000 more. 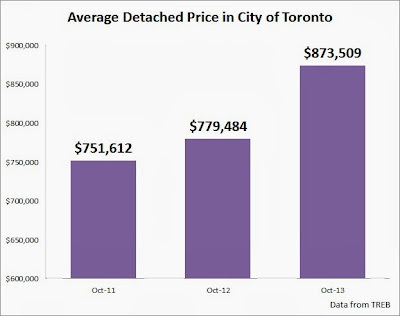 A 20% downpayment for the average detached home in October 2012 was $156,000 and $175,000 in October 2013. So a year later, you would need another $19,000 towards the average detached home in Toronto in order to avoid costly CMHC insurance. Overall, the median home price in the GTA was up 5.8% on a year/year basis. 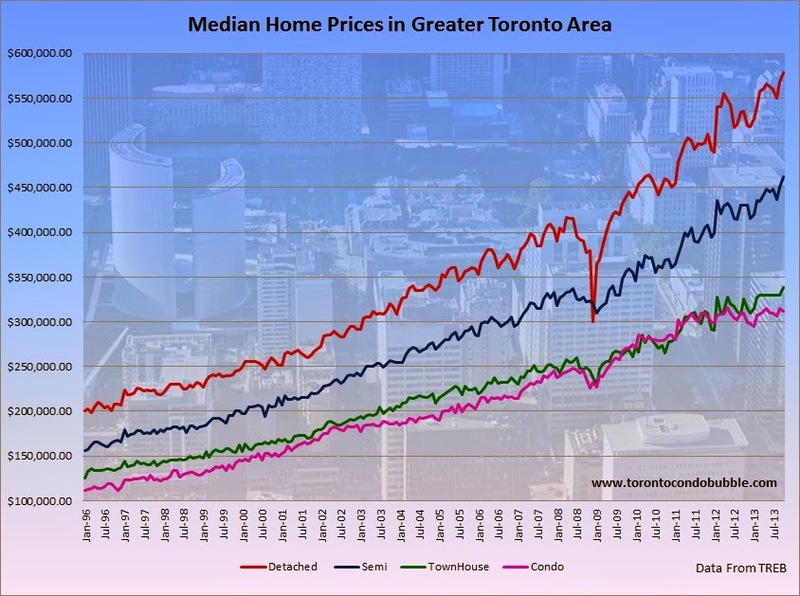 Median detached price was up by 8% in the GTA, semis up by 7.5%, townhouses went up by 3.8% and the median condo price in the GTA went up by 1% compared to a year earlier. 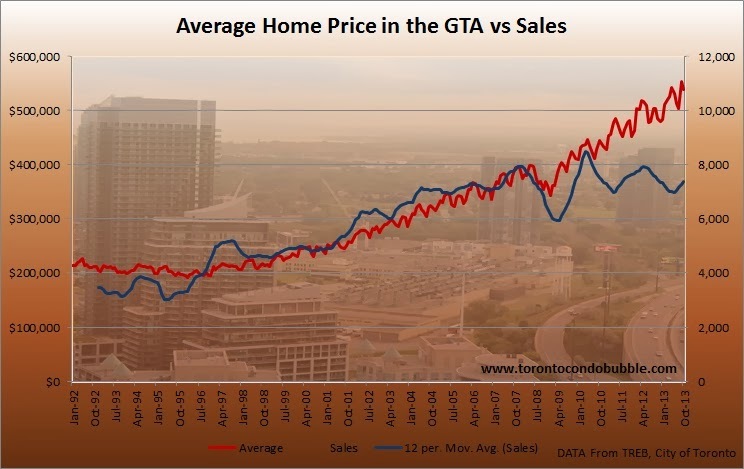 All in all, the Toronto housing market has rebounded strongly this past October. Not surprisingly, this made Flaherty worry about the bubble getting larger so he threatened to intervene yet again to calm the market. “And I’ve intervened four times in the last several years, and I’ll intervene again if I have to to make sure we don't create a housing bubble." 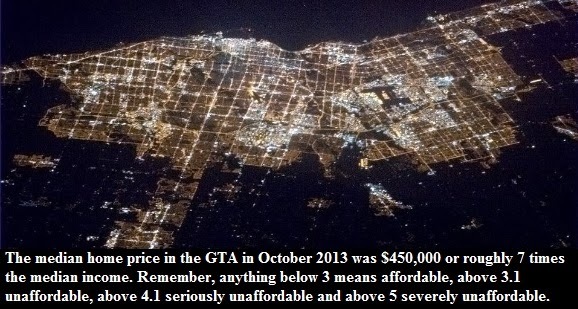 Too bad that we already have a giant housing bubble in Canada created by no one other than Flaherty himself. Nevertheless, the larger the bubble grows, the greater the economic damage down the road will be. 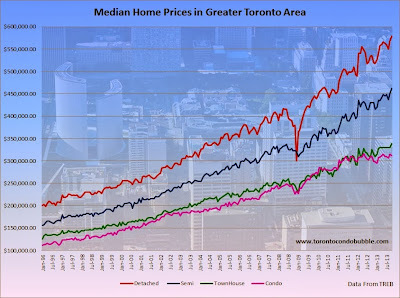 Flaherty might as well intervene one more time to minimize the eventual housing fall out. Meanwhile Canadians will continue to be delusional when it comes to real estate.